WUWT is one of a multitude of conspiracy theory blogs on the internet. Anthony Watts, the blog owner, specialises in conspiracy theories of the climate kind. Today he's posted another article from one of his nuttier paranoid guests, whose name is Tim Ball (archived here). He's a frequent guest also on one of the even nuttier websites in Canada, which promotes "Freedom Water". Tim is just writing about his normal (normal for him that is) theories that global warming is a plot hatched by a man called Maurice Strong. You can read an interview with Maurice Strong at the Guardian - by Leo Hickman, back in 2010. Apparently Maurice Strong created global warming back in the 1980s. He must have had thousands of people in on the conspiracy, because he was able to alter scientific journals dating back to the beginning of the 19th century. That means he must have not only co-opted some of the world's leading scientific publishers and all their staff, he must have hauled in librarians all around the world to doctor old copies of scientific journals. Imagine the work involved. Getting paper and ink of the right age. Changing the numbering systems going back through old editions. Getting someone to manufacture identities with names like Jean Baptiste Joseph Fourier, John Tyndall, Svante Arrhenius and Guy Stewart Callendar. Strong was even able to alter historical White House reports that were given to the US President, Lyndon B Johnson, back in 1965 and insert a report by some fictitious character called Roger Revelle. You want proof? Surely not. Isn't the word of Anthony Watts and his sidekick Tim Ball sufficient proof? One curious thing is that Tim Ball hails from Canada. So does Maurice Strong. Strong was born in Manitoba, which housed the university at which Tim Ball taught geography. I don't know if their paths ever crossed. I imagine that Tim would cower in fear if he ever met this god of a man in person. A major challenge for those fighting the manipulations of the IPCC and politicians using climate change for political platforms is that the public cannot believe that scientists would be anything less than completely open and truthful. They cannot believe that scientists would even remain silent even when science is misused. The politicians exploit this trust in science and scientists, which places science in jeopardy. It also allowed the scientific malfeasance of climate science to be carried out in the open. A particularly egregious exploitation was carried out through science societies and professional scientific groups. They were given the climate science of the IPCC and urged to support it on behalf of their members. Certainly a few were part of the exploitation, but a majority, including most of the members simply assumed that the rigorous methods of research and publication in their science were used. Lord May of the UK Royal Society was influential in the manipulation of public perception through national scientific societies. They persuaded other national societies to become involved by making public statements. Scientific societies are peopled by sheeple, obviously. They are not in a position to judge science for themselves. Not like the fake sceptics at WUWT, who just know that climate science is a hoax, a scam of gigantic proportions, all manufactured by a single individual, oil magnate Maurice Strong. The Russian Academy of Science, under its President Yuri Israel, refused to participate. At a United Kingdom Meteorological Office (UKMO) 2005 climate meeting he was put in his place. “The Russian scientist was immediately and disrespectfully admonished by the chair and former IPCC chief Sir John Houghton for being far too optimistic. Such a moderate proposal was ridiculous since it was “incompatible with IPCC policy”. Israel, a Vice-chair of the IPCC, knew what he was talking about from the scientific and political perspective. d) Sea level rise should be less than 1 m.
Well, that wasn't a very good denial of global warming was it. Tim ought to check his sources more carefully. 2. "Climate change" means a change of climate which is attributed directly or indirectly to human activity that alters the composition of the global atmosphere and which is in addition to natural climate variability observed over comparable time periods. 1. "Adverse effects of climate change" means changes in the physical environment or biota resulting from climate change which have significant deleterious effects on the composition, resilience or productivity of natural and managed ecosystems or on the operation of socio-economic systems or on human health and welfare. Because of the political agenda people were allowed to believe the IPCC were studying climate change in total. The reality is you cannot determine human causes of change if you do not know or understand natural causes. 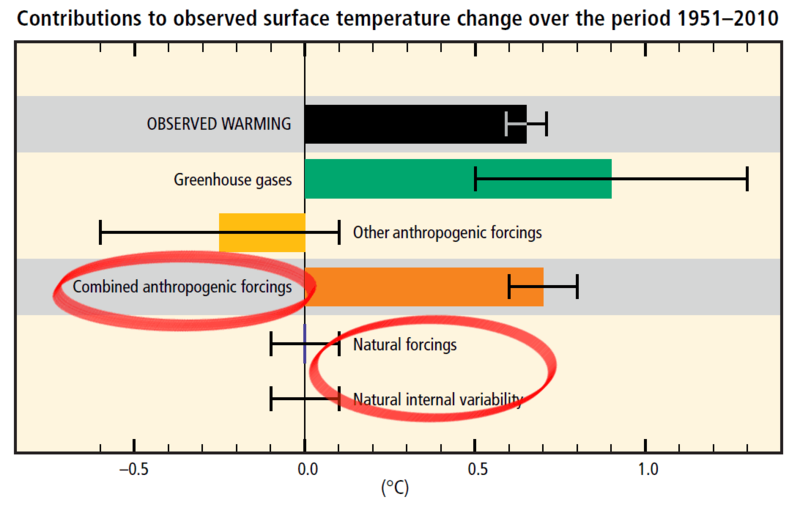 The forcing diagrams used in early IPCC science Reports illustrate the narrowness (Figure 1) and its limitations. He must have missed them. Nor does Tim attempt to say what he thinks has been causing the earth to heat up so dramatically. He might have wanted to avoid the word "magic". Most people, including most of the media don’t know that the science reports exist. This is because the Summary for Policymakers Report is released with great fanfare months ahead of the science report. GENEVA, 30 September – The Intergovernmental Panel on Climate Change (IPCC) has posted online the full Working Group I contribution to the Fifth Assessment Report in an unedited version, following the release of its Summary for Policymakers on 27 September 2013. Anthony Watts specialises in disinformation at his anti-science blog, WUWT. This is just one more example not just of plain disinformation, but of paranoid conspiracy nuttery. The vast majority of people who have ever studied climatology have studied it in the last 25 years. Hardly anyone was studying the field before it became important in saving the world. Most of the university departments didn’t even exist before the 90s. That means the vast majority of people who have ever studied climatology have based their whole career on the science being right over those 25 years. Backing down from that is not a good career move when nobody in the field has anything else to pull back to. Why fund these new departments if they aren’t saving the world ort getting anything right? andrewmharding lists all the things he thinks that scientists have got "wrong". Does he really and truly believe this? Where on earth does he get his quackery? Agree totally with you. Second hand tobacco smoke, less saturated fat in the diet and more carbs, unleaded petrol, diesel as opposed to petrol Climate change aka AGW. The list is never ending. Bruce Cobb doesn't hesitate to let everyone know he is an utter nutter of the climate conspiracy kind. Why pussyfoot around? They are Climate Liars. They come in all stripes, and have varying reasons for being part of the Biggest Lie in human history. How much of the IPCC report do you need to read before they give you the only actual science: the amount by which the CO2 warms the planet without feedbacks. c) in any of the of the material for policy makers? d) in the technical summary? If it’s not obvious, the simple science – the only actual science in this whole damned scam is no where in the IPCC report. Mark from the Midwest waffles and manages to say nothing much of any consequence. What he does say he's not taken to heart. Just how hot will the world have to get before he "knows when to cut his losses and move on"? He's clearly a climate conspiracy theorist, so probably ten degrees of warming wouldn't convince him. I believe incompetence and deception are not mutually exclusive, although when the incompetent engage in deception it’s not always an intent to deceive. When you are sufficiently incompetent to “not know what you don’t know” it becomes much easier to defend your work in non-scientific ways, (e.g., they’re “confused” or “the missing heat is somewhere … we’ll find it”), rather than revise, correct, improve. I’ve spent much more of my professional life in private industry than in academia, and In business the smart people aren’t always the one’s who get it right the first time, the smart people are the ones how know when to cut their losses and move on, while the dumb ones will gladly stay with the sinking ship until it’s too late. Here are some late entries to the weirdest, wackiest and most implausible conspiracy theory competition, run daily at WUWT. Many deniers' are obsessed with money and cannot conceive that there are people for whom knowledge is a much bigger driver. Deniers really are nuts. The sad part is that there are those that prefer to be part of the political solution based on the fact that “baby, that IS where the money is.” You can be a good scientist, do the studies and realize that the public and policy makers are being duped, but unless you prefer to work as a stall cleaner at the race track, you are in no position to say anything, for “politics” pays the bills, not “being correct.” Thus you have no choice but to compromise yourself, or cease having a job in the field that you studied. And frankly, working in the field you studied will pay back those “student loans” faster than cleaning stalls at the local race track. Truth may be the first victim, but integrity is a close second. Authoritarians bent on totalitarian rule always insist that the “truth” is simply what ever they say it is. If they say that co2 causes warming and must be “stopped”, then that is simply the way it is. If you question this arrangement you are questioning their authority to rule you and their power to destroy you; science has nothing to do with it. It is a racket. The same scientists who produce the IPCC “assessment reports” that lead to UNFCCC recommendations get paid to implement those recommendations by their home countries as consultants to the government (Example: University of East Anglia influential in IPCC assessment, which leads to UNFCCC policy recommendations. Tyndall Centre is then conrtacted by DEFRA in the UK to implement UNFCCC recommendations — and Tyndall Centre is — University of East Anglia). So the actions of those who sit in the IPCC panel bring cash into the university. I didn't realise Mike Maguire was such a conspiracy nutter till now - of the Tim Ball/One World Guvmint/New World Order/Agenda21/Maurice Strong type. He says he used to be a meteorologist before taking up this new hobby. People are strange. You’ve written many good articles but this one seems to concisely nail the root of the problem especially well. Wow; that Strong chap must have got into my loft and reprinted those pages in that 100 year old textbook without my realising. Ha ha I am reminded of the time I was told at the pub by a fellow drinker that Margaret Thatcher "invented" global warming so she could shut down the UK coal industry and thus weaken the Trade Unions. I know Maggie was evil, but that evil? Is it just a coincidence that "Guy Stewart Callendar" is an anagram for "nuclear strategy law D"? I hardly think that possible. I hope you are being ironic! The 'precious bodily fluids' stuff is always entertaining, but, as Bert says, is largely imaginary, and completely dwarfed by AGW in any case. Funny how that link above claims a title (example: "Weather Modification Shasta+Siskiyou Counties CA Dec 23, 2008") yet when the link is followed, the actual article is titled "More Rain Headed Our Way". There are ton of articles deliberately mislabeled like this. Fair reporting? Hardly. More like a deliberate deception to weak minds. Then, when you actually READ the articles and what they contain, you notice that they do not contain any real evidence of "weather modification" or "climate modification" as claimed by connedspiracy theorists. There are links to EXPERIMENTS and cloud seeding and so forth, but this is not evidence of CLIMATE MANIPULATION (droughts / no snow) in particular) as claimed by the connedspiracy theorists. Nor does it even remotely account for the extreme weather events / climate changes recorded WORLDWIDE. Studying the weather is now grounds for "connedspiracy" to these idiots. Wow. ANYTHING to "not believe" that human-caused global warming is the REAL CAUSE of climate change. If they had their way, we'd ban science and scientists, return to the Dark Ages with superstitions and utter nonsense, and tar and feather all academics and institutions of higher learning as "evil doers" and their attempts to better the human understand of nature and the world we all live in (reality). The danger we have with connedspiracy theorists is that they are simply stupid beyond belief, and promote their brand loyalty among gullible and ignorant people. The followings that they generate are deliberate and not accidental (it's very profitable for them). But even worse then widely promoting "dumb" is what this does to hinder the human race and the advancement of real knowledge and development. Climate change in particular is DEADLY and already responsible for the deaths of tens of thousands per year (and expected to get much, much worse). The longer connedspiracy idiots are tolerated to preach their brand of stupidity, the longer humanity will have to endure the effects of their ignorance and denial. It is not without harm. It is very harmful and it needs to stop. Connedspiracy theorists are quite stupid. Using straw arguments, conjecture and circular reasoning, and the lack of evidence "as evidence" for their ridiculous theories, they conjure up all kinds of stupid plots. I've personally investigated many of their theories. I found none of them accurate, truthful, honest or intelligent. Connedspiracy theorists lack common sense and even a basic grasp on reality. I wrote against them for many years on my blog. It never bothered me that they took their business elsewhere when I punctured their bubble-minded fantasies. So here we all sit, 2015, decades later, after exposing their ridiculous theories over the last few decades. Virtually NOTHING they have claimed has come true - but the position of anthropogenic global warming has most certainly "come true" even for the most obtuse. Yet they refuse to "believe" (open their eyes and see reality). You'll be writing on and against connedspiracy theorists until Doomsday or the world burns up - whichever comes first. I wash my hands of them - fools do not deserve to be immortalized in print. jmorpuss's next comment has also been moved to the the HotWhoppery. Time travel. It's the only thing that makes sense. Strong must have access to alien technology from Area 51 or some-such. No need for conspiracy theories about suborning thousands of librarians etc. it's the only logical scenario. presumably the same technology But.....Al Gooooooooooore used to travel back and rename the Intergovernmental Panel on Global Warming once The Pause started getting too inconvenient. The Climate Denial Bingo Card is already the size of a bedsheet. I think we'll just change a few of the entries.